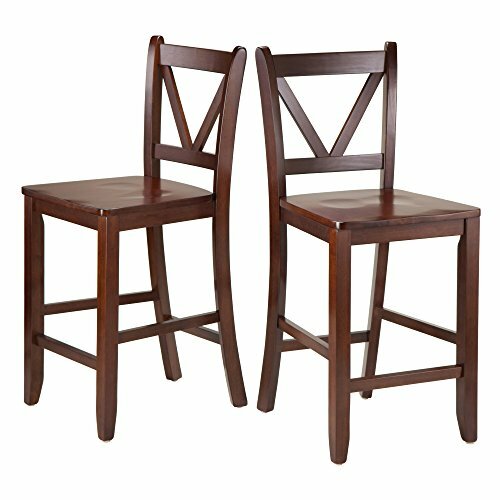 Classic counter v ladder back design stool/chair with high back add a touch of elegance and comfort to your dining room. The actual seat dimension is 16.54”w X 15.55”d. Back rest dimension is 16.54" W and 15.24"h. Seat height is 23.98" From ground. Overall chair size is 16.54"w X 19.21"d X 39.17"h. This counter v adder back stool/chair is a sturdy solid wood construction that can hold up to 220lbs. Walnut finish. Ready to assemble. This set comes with 2 v-back bar stool/chair assembled size is 16.54"w X 19.21"d X 39.17"